Welcome to DMM’s 4/3/17 Movie Monday, where I’ll help you tackle movie night with brief reviews of movies and videos you may have missed. This week, I’m spotlighting the work of New Zealand musical comedy duo Flight of the Conchords. Everything featured here is currently rated 4.5/5 stars; these guys are good! 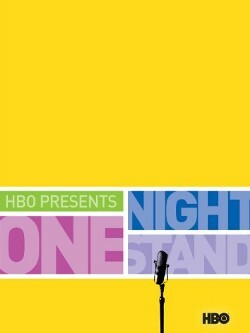 Most people here in the U.S. got their first exposure to this musical comedy team in HBO’s One Night Stand: Flight of the Conchords (NR). This clip from YouTube captures their quirky style far better than any description could. 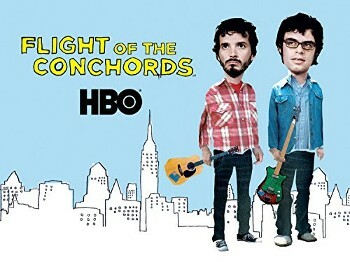 That stand up special was so well-received, HBO gave the greenlight to a series based on Flight of the Conchords’ experiences trying to make it as musicians in New York City. Jemaine Clement & Bret McKenzie may be New Zealand’s 4th most popular folk parody duo, but they’ve arrived to conquer America in Season One of this musical comedy series. 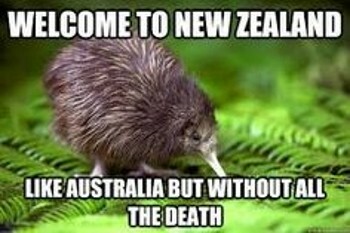 The show co-stars their fellow New Zealander Rhys Darby as New Zealand tourism agent Murray, who moonlights as the Conchords’ manager. The hilarious Kristin Schaal is featured as Mel, their one obsessive groupie, who makes no effort to hide her lust for Bret despite being married. Music videos of their clever and funny songs are sandwiched between very funny scenes of their struggle to get gigs, pay their rent and keep Murray happy. 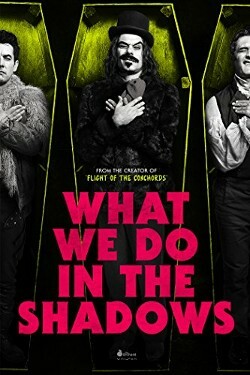 More recently, Jemaine Clement co-wrote, co-directed and co-starred in the multiple award winning mockumentary What We Do In The Shadows (R). The brief description doesn’t do this black comedy justice. Dealing with the mundane realities of life is the backbone, but the subplots of each character’s backstory and role in the group spin out from there. Rhys Darby is here again, this time playing a the leader of a rival werewolf pack. The truly believable special effects are surprising, and amp up the comedy even more.